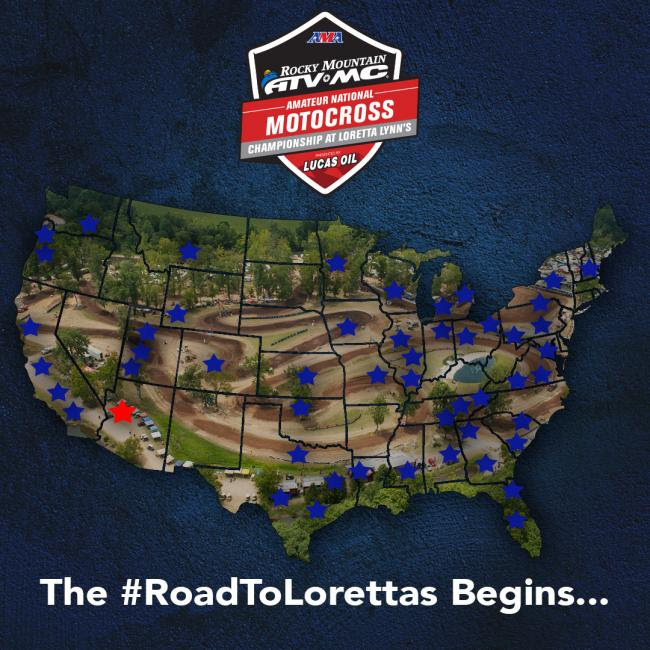 The #RoadtoLorettas begins this weekend with the first area qualifier. For riders in the Northeast, here are the important locations and dates, including the Youth Regional at Englishtown’s Raceway Park this June. MORGANTOWN, W.Va – The first step to qualify for the 36th Annual Rocky Mountain ATV/MC AMA Amateur National Motocross Championship, presented by Lucas Oil, begins this weekend in the Southwest region. Arizona Cycle Park in Buckeye, Arizona, will play host the first of 57 different Area Qualifiers, this weekend, February 11 and 12. The Area Qualifiers serve as the first phase in qualifying for the world’s largest and most prestigious amateur motocross championship. The Regional Championships then serve as the next step to seed riders into the National Championship. Only riders who finish in a qualifying position at a Regional Championship are eligible to race the National the week of July 31 through August 5, 2017, in Hurricane Mills, Tennessee. The AMA Amateur National Championship is the world’s largest and most prestigious amateur motocross race where riders from all over the world compete in the National class structure that includes classes for youth riders on 50cc bikes all the way up to vet and senior classes. In addition, all Area Qualifier participants will be included in the Rocky Mountain ATV/MC Race Gas Program, where each racer will receive one $10 Race Gas gift card redeemable on all products carried by Rocky Mountain ATV/MC. Racers who qualify for the Regional Championships will receive a gift card valued at $20 as well as the AMA Amateur National. The 2017 Rocky Mountain ATV/MC AMA Amateur National Motocross Championship, presented by Lucas Oil, takes place July 31 through August 5 at the renowned Loretta Lynn Ranch in Hurricane Mills, Tennessee.